Drawing from experiences in a range of developing, emerging and developed countries, our research suggests that the best approach is staged and progressive, and is focused on four main pillars. 1) The first pillar requires building digital identification and e-KYC systems to simplify access to the financial system. Once these are established for individuals and businesses, they provide a solid foundation not only for finance, but also for the development of the digital economy more broadly. 2) The second pillar requires digital payment infrastructure and open electronic payments systems, as these are the primary way to facilitate digital financial flows in an economy. 3) The third pillar combines the promotion of account opening and access with the electronic provision of government services, particularly for public transfers and payments, so as to scale up the use of digital finance and related services. By supporting access, payments and savings, together these three pillars provide a foundation for digital financial transformation and financial inclusion. 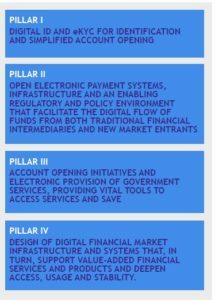 4) The fourth pillar – design of digital financial markets and systems – builds on the first three to support broader access to finance and investment, by underpinning use cases including securities trading, clearing and settlement, and other more sophisticated financial functions. Access to the full paper here.